Attorney Matthew S. Forlizzi comes to the firm bringing experience in the areas of Criminal Law, Domestic Relations, Wills, Trusts and Estates. A graduate of Colby College (B.A. Government) and New England School of Law (J.D. ), Matthew takes pride in fostering a professional relationship where his clients feel comfortable with an often-times overwhelming situation. He gives each client the individualized attention he or she deserves, putting each at ease by answering questions and explaining our complex legal system. Through his tireless effort, superior communication skills and zealous advocacy, Matthew has successfully guided clients through difficult situations in their lives. The quality of his representation is apparent in the number of referrals from satisfied clients. 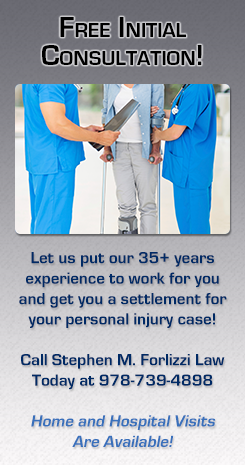 No matter what your situation, Attorney Matthew Forlizzi will fight for you. For a Free Initial Consultation, Contact The Law Office of Stephen M. Forlizzi Today. Essex County, Suffolk County, and Middlesex County, including the cities of Andover, Danvers, North Andover, Lawrence, Marblehead, Gloucester, Salem, Beverly, Lynn, Peabody, Middleton, Topsfield, Lynnfield, Saugus, and the North Shore of Boston. The information on this attorney website is for general information purposes only. This information on this website is not intended to create, and receipt or viewing of this information does not constitute, an attorney client relationship.